This delicate little thing is the first of a small faction I am developing for Victorian/steampunk gaming. It is a plastic figure, from the Malifaux range, the Oiran. 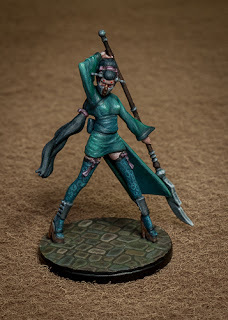 This is Jade, member of a shadowy, secret society known as the Silver Serpent. She will be joined by more willowy figures like this, plus a couple of more solid compatriots. The details on this figure are absolutely tiny. I usually paint with a number 2 or larger brush for the majority of my work, number 1 for eyes if need be. For this model I had to go down to a number zero and dig out the optivisor - the eyes were especially challenging. The base is a nice solid 2p piece, giving the figure a bit of weight, hopefully it will not blow away in a slight breeze now. In terms of gaming, I have recently enjoyed playing In Her Majesty's Name in the gaming dungeon. So far, all the games have been played using Matt's collection, but I thought it would be nice to add some figures and flavour of my own. It will take me a while to get this faction painted, so I might use Dystopian Legion French troops as a short term solution. But rest assured, the Silver Serpent lies coiled, waiting to strike. 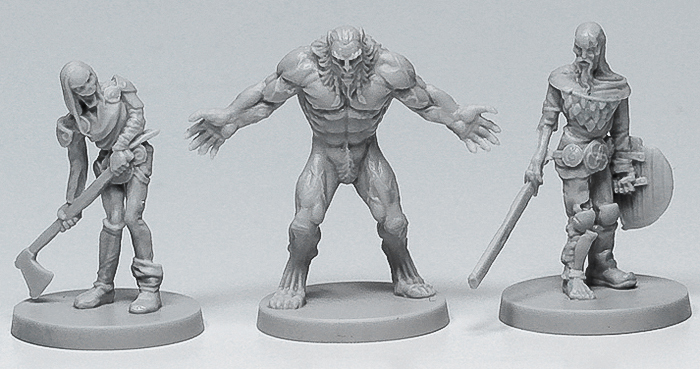 Pictures of the production versions of the Blood Rage figures have been released, and they certainly seem to live up to the original concepts and masters. On these photos I have removed the blue and sharpened them a little, but otherwise they are as sent. Nice sharp detail throughout, even on the smaller figures. They were originally promised for September but I always reckon on some delay with kickstarter projects. Hopefully they will be in my hands by xmas, giving me a nice project to while away the winter gloom. 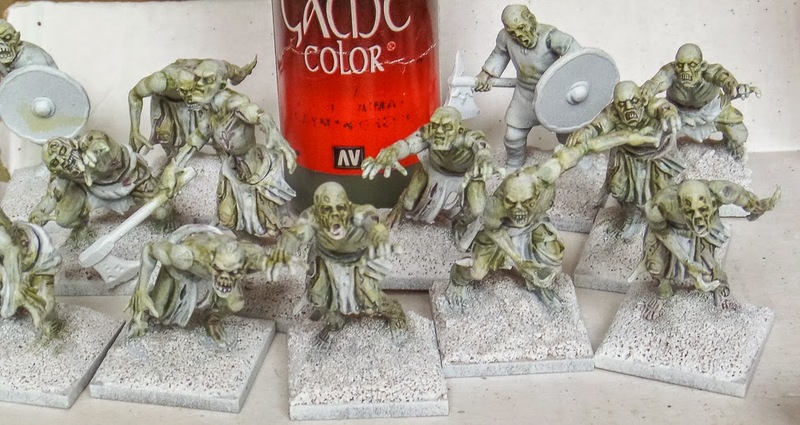 Even though the figures are part of a boardgame, my intention is to use them in Saga, or Dragon Rampant, or anything at all really. I can just imagine the werewolf stalking the Victorian streets in a game of IHMN or similar. And you don't have to possess the cunning of Loki to imagine what I will be doing with the undead vikings! I managed to get the first batch of shambling Nordic revenants painted up fairly quickly. 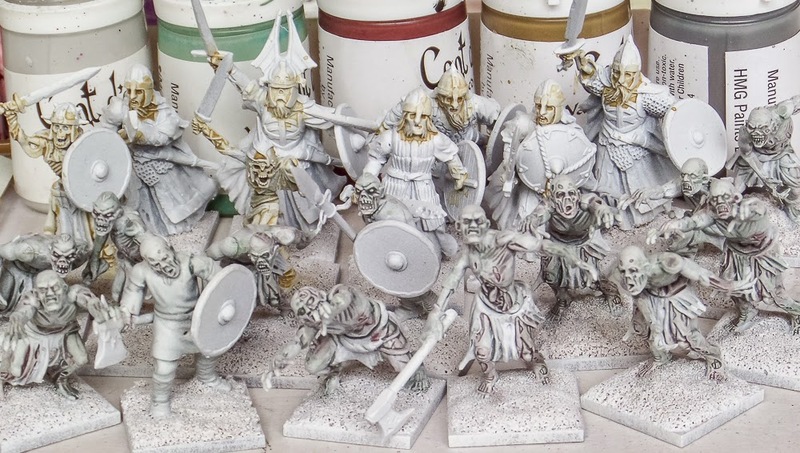 Most of these are simply mantic zombies and ghouls, with just a few viking bits to add flavour. Future batches will contain more historical bits, so in the end they will look more viking like than this lot. 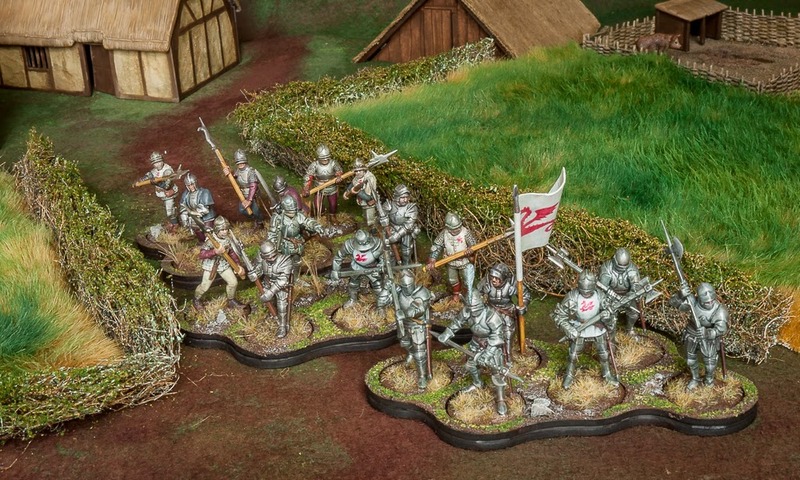 There's 13 figures here, enough for a unit in either Lion Rampant or Saga. I see them as lowly fighters, the equivalent of bondi or even levy troops. I am hoping to double their number, and also add some more elite troops. When it came to painting the viking undead, I had a search around for a palette. I wanted something greenish, to contrast with the red tones of the clothing and shields. 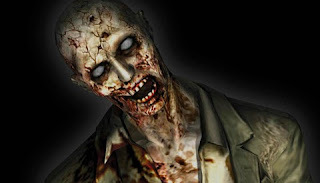 I used this image as a starting point. The zombies were primed white and then I glazed with a grey and red, to give an undercolour of shade. The rest of the steps I have shown below. Each colour is thinned and matt medium added to add transluceny. In the last picture I have also picked out the eyeballs and teeth with a very light grey (white is far too bright for eyes and teeth). 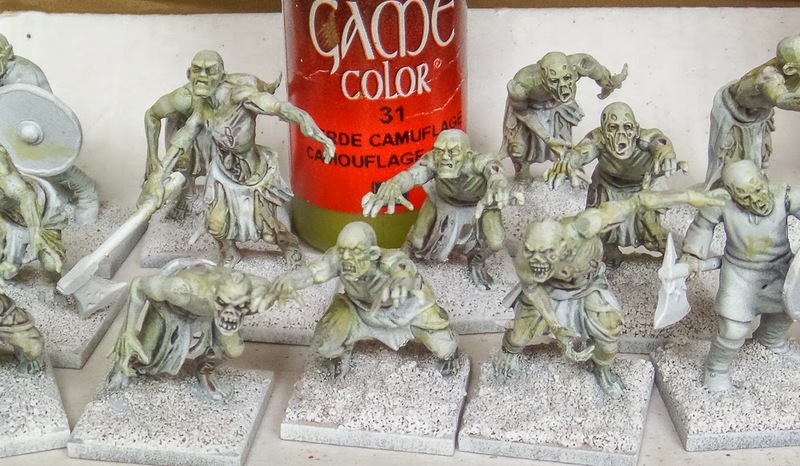 Once the rags and weapons are painted I added more shading to feet and hands and splashed on some gore. 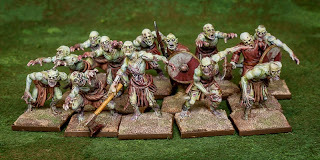 I finally finished painting the warg riders. There's eight in total, though as they are mostly metal only six are unique. 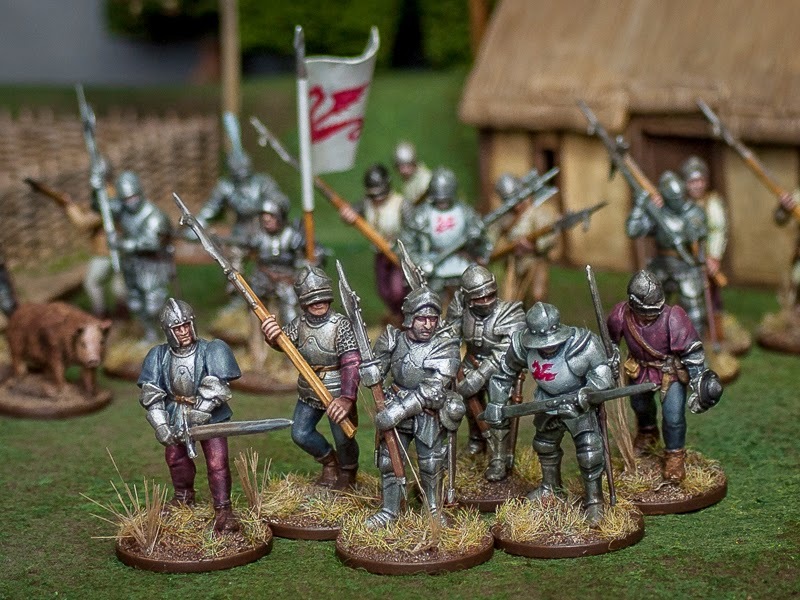 That's fine for Lion Rampant, when playing Saga there will be a couple of duplicates. 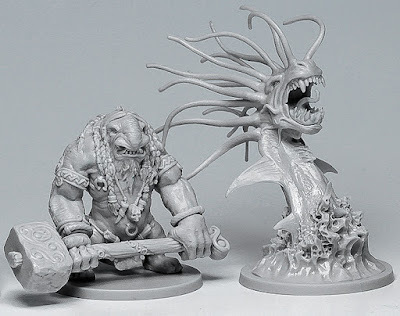 I must dig out (or invent) a battle board and get some games with them. When it came to the palette, I was struck by how much the beasts looked like hyenas rather than wolves. A quick google and I was sold on the pale brown fur. The muzzles are grey for a little contrast. The riders are pretty drab, to match in with my Mordor and Isengard collection. 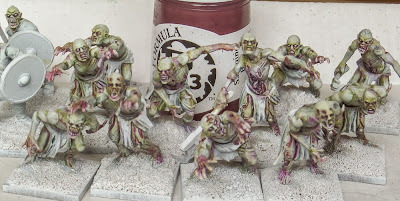 Another unit crossed off my painting list, a satisfying feeling. 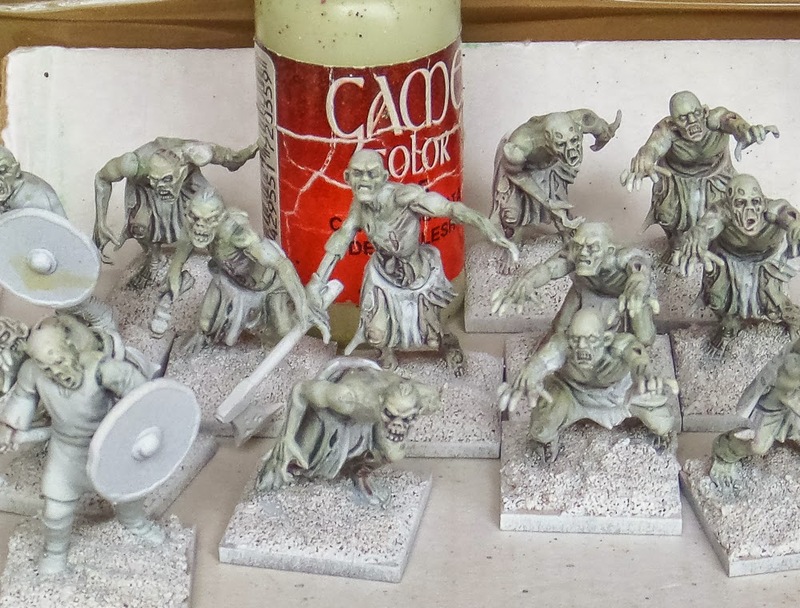 I have quite a large force of orcs now, so I need to switch my efforts to the good guys for a while - either paint more Rohan or Dwarfs. Another glimpse of a set of lovely sculpts by V&V Miniatures, courtesy of the Beasts of War news site. 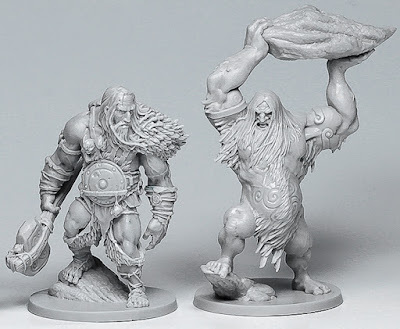 Again, these are described as resin casts, available only from Russian supplier Hobby Bunker. This makes them quite hard to acquire, but if they continue to release sculpts like this I may well take the plunge. One more set and it may be worth paying the postage supplement. 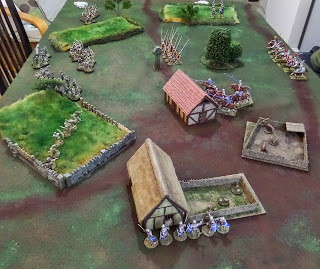 More games of Lion Rampant. After last week's outing in the dungeon, this week it was a return to the more compact dining room table. Eagle eyed viewers will note the newly constructed pathways and village area on my wargaming blanket. 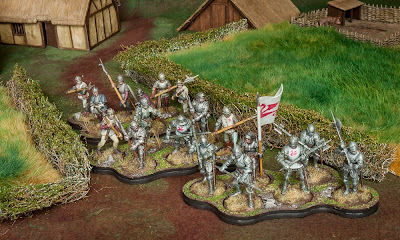 Lord Clifford and his men, buoyed by their victory against the Normans, marched on to Italy to try their luck against the condottiere Stephano di Pollo. I'm not sure if that was his actual name, but that's what Clifford's men called him. For these games we decided to add a simple house rule. Each general received the Commanding trait, allowing them one reroll per turn on a failed activation. Hopefully this would remove the sometimes wildly random failures that can frustrate, annoy or even ruin an evening's entertainment. The generals also gained one other trait. Clifford was strong (of course, though he forgot about it in the heat of battle). Stephano was insipid, his men would not receive +1 courage for his presence. After seeing his performance on the battlefield, it was easy to see why! 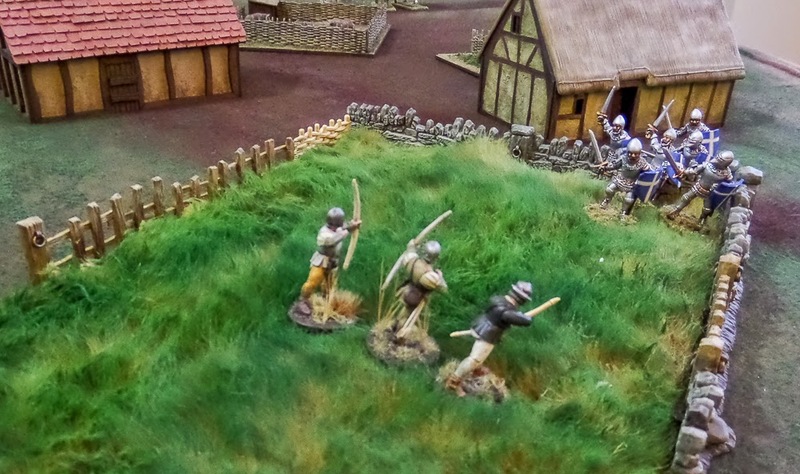 In the first scenario the two forces vied for control of a strategically important village, nominally fighting over the stone cross on the outskirts. After a promising early start in which Stephano's men boldly siezed the objective, they came under withering arrow fire and were forced to retire. 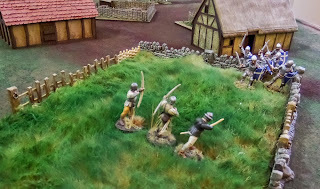 From their advantageous central point, Clifford's archers were able to pour arrows into any advancing force. Stephano pleaded with his men to hold fast, but his insipid cries were lost in the din of battle, as his troops clanked past him to the rear. The extra 1 on the courage roll could have saved at least one of these units, and rolling a double 1 never helps either. Stephano and his remaining men retreated to the nearest trattoria. For the second scenario we chose another simple game, bloodfeud, which is basically a kill the enemy general scenario. Stephano declined to hunt down his tormentor Clifford, so it was up to me to hunt down the enemy. This turned out to be easier than anticipated. The enemy general mounted on cavalry suffers from wild charge, so it was relatively straight forward to march my expert billmen towards him, shout insults, receive the charge and dispatch the dog (or should that be chicken). Two games in two hours, a couple of beers, a few laughs (and for the loser, a cup of lukewarm tea). What more could you ask for on a Friday night? I spotted this on one of the news sites. 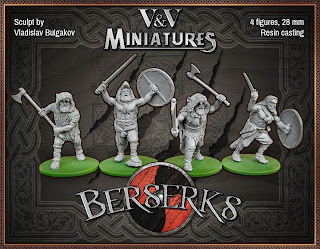 These are resin figures by an unknown (to me) company, V&V Miniatures. 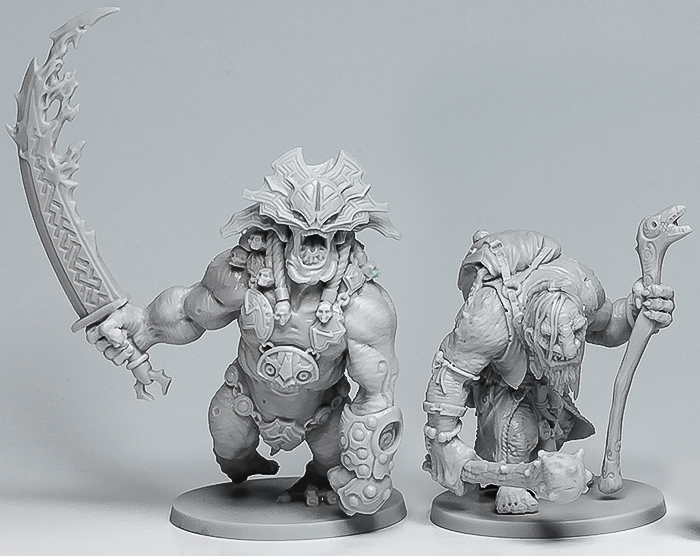 What an absolutely lovely set of sculpts. These are described as resin figures, what kind of resin is unclear, but they certainly look to be good quality castings. If only they were available in the UK. Perhaps one of the distributors will pick them up. That would help to boost sales I would imagine, maybe allowing the company to expand and produce even more sculpts. 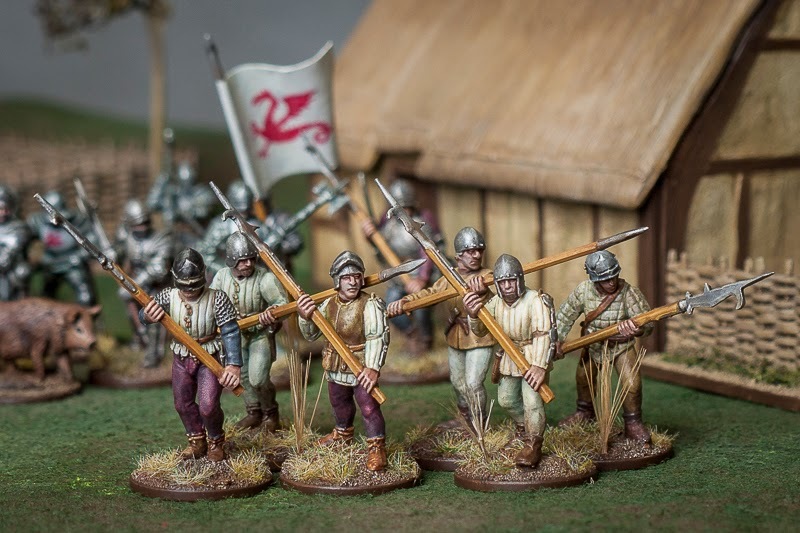 I reckon these would fit in very nicely with my Drabant vikings, just have to hope that, like their ancestors, they make it across to English soil. 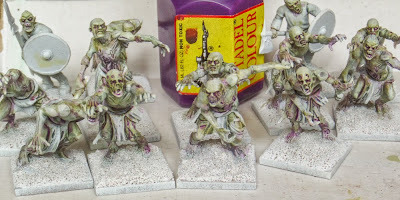 The first fantasy army I collected, over twenty years ago, was the Undead. 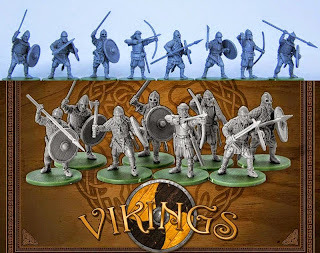 The first historical army I owned was a viking army. 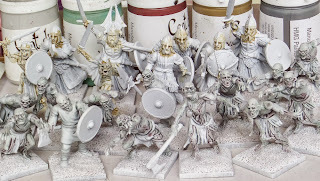 I guess there's a certain inevitability about me starting an undead viking force. I have a few good reasons to be painting this lot up. First, there's a revenants battle board for the Saga game I can use them with. 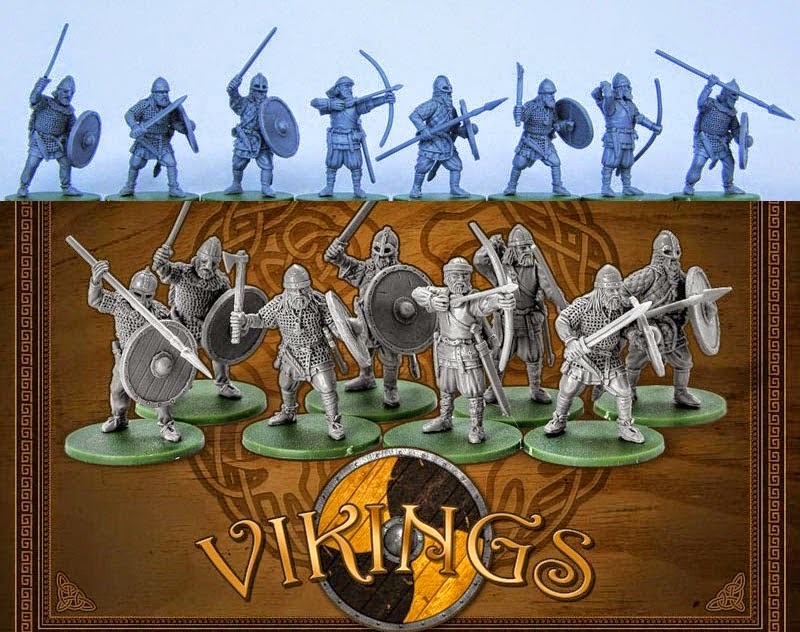 Secondly, I would like to have a fantasy force available for gaming the new Dragon Rampant game when it surfaces later in the year - I am also thinking that I should receive Blood Rage at about the same time, so having a fantasy force of vikings and undead vikings would make sense. Thirdly, most of these models were already built to be used as zombies in a WHFB army, so it only took a couple of hours over the weekend to get the rest kitbashed. As you probably realise, there's a combination of Army of the Dead, mantic undead, and a smattering of historical bits been used. Fourthly, I enjoy blasting through figures like this at a fast pace, far quicker than I can complete commission work. It's early days yet, this is after just one painting session, but I already feel like I have made a lot of progress. The final unit of my Lion Rampant retinue painted. The lightly armoured troops I group together into one unit and play them as Foot Sergeants. The more heavily armoured I play as Foot Sergeants with an expert upgrade. This represents (in my mind at any rate) the distinction between well armoured and better trained soldiers and those who are more part time. From my background reading it would seem that there's little evidence about how troops were deployed, but of course for the sake of wargaming we make these convenient distinctions. I think I have now played just about every scenario in the book, both using these troops and some Lord of the Rings figures. Each troop type performs a different role on the tabletop and I am still learning who does what. While there is a lot more randomness than most games I have played, there is still a need to keep your wits and put your troops to their best use (and then pray for decent activation rolls!). The Perry figures I used here stand head and shoulders above their plastic competition - in fact I would rate them as better than the metals too, including their own. The main disadvantage to the plastics is the brittle weapons, I have already suffered one snapped bill head during action. 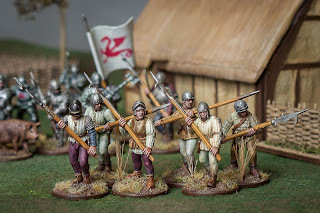 Undeterred, I will be searching through their medieval ranges for inspiration, probably later in the year. I have a fancy to build a more generic, more classic medieval force. In the meantime, here's Clifford and his household retinue at the May Day parade.